John Armstrong (Centre half, 2007-15) – John Armstrong joined Hearts from their youth system and played his first senior match in 2007 when Hearts defeated Dunfermline in the Scottish Cup. He came to Cowdenbeath on loan soon after that at the same time as his Hearts’ namesake David Armstrong. John did well at Central Park and in time his move was made permanent. John Armstrong then played a leading role in many of our successes – including 2 promotions, some wonderful play-off occasions, a League title and four second tier seasons during one of the club’s finest eras. 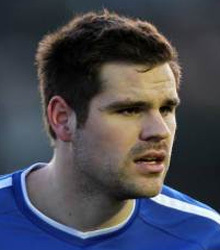 John made 238 League appearances for Cowden. He was our Player of the Year in 2014 and was also our Players’ Player of the Year on more than one occasion. His centre back partnerships with Darren McGregor and Joe Mbu in particular were the bedrock of several of our successes. He skippered the club in the latter stages of his time at Cowdenbeath. He left Central Park for a player/coaching role with Edinburgh United late in 2015.